NAP came 2nd (looked like going to win coming off the final bend traded at 1.78) just beaten by an improver. FALSE FAVOURITE got beat – WINNER FOR US. PLACE VALUE – Came third and if you did it at 2.3 it was a great price. Back to Lay – BSP 13.5 delivered 46% profit. Not able to sustain the effort (Sullivan/Carr are going great guns at the moment). 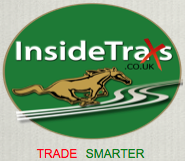 Please follow the link for our unique TrackFaxs briefing on Leicester racecourse; it tells you about the draw, pace analysis and riders & trainers records at the course. What is Scalping? How do I choose the right horse? AND what do I need to do to increase my profits? The NAP OF THE DAY runs at Leicester 3.40. This Clive Cox trained runner has done well so far and been placed to a couple of quite talented horses – Enbihaar who went on to be a 2.5l 4th in a listed race at Ascot and Midi who won NTO and is now competing in Class 2 events. His opening handicap mark of 82 looks lenient (Timeform doesn’t think so!) compared to Showroom’s 90. James Doyle is back on board. Money has come for the horses this morning so it might be a little short at the moment at 4.4. Not an entirely confident choice so keep stakes to your minimum unless you too are convinced. As the 1m course is a two furlong up hill section followed by two sharp bends, it is really important to get out and be in front before the first bend. This favours front runners who are drawn LOW! The selection is trained by the wily Karl Burke and he has his good apprentice on board taking off 7lbs. I expect him to get out of stall 2 and lead coming off the final bend by perhaps three lengths or so. The chart below shows this horses does trade below BSP (8 out of last 11 starts). ADVICE: Back to Lay looking for 33%+ profit on your stake – unless he doesn’t get the lead then CASH OUT. Currently trading at around 13.5 our unique “Back to Lay Staking Calculator” will advise you to lay at 10.15 to get 33% return guaranteed on your money. On ratings this horse should have the same chance as the current favourite Mr Buttons (his stablemate) but is three times the price. P J McDonald rides the selection for Richard Fahey while the apprentice get the ride on Mr Buttons. At 2.96 for a top 3 finish or 2.16 for a top 4 finish I think this is good value.